This episode is exactly the same as Season 5's "Bart Gets Famous," except the animation has been redone. Conan O'Brien guest stars. Lisa develops a crush on her new neighbor, House Minority Leader John Boehner. After accidentally stumbling into Mr. Burns' time machine in the attic, Smithers is transported to the Dust Bowl era, where he is forced to confront the darkness lurking inside every man through a series of cliché-ridden symbols and metaphors. Guest-written by Robert Jackson Bennett. Lisa becomes a famous twee musician, much to the chagrin of Bart, who feels his own musical talents are being neglected. Calvin Johnson guest stars. The Simpsons celebrate their ninth Christmas of the year. The Leftorium becomes a popular hangout for liberal activists, who introduce Ned Flanders to the world of the blogosphere. Soon he becomes hooked on left-wing commentary and achieves minor celebrity status as a blogger on the Huffington Post. But his newfound liberalism quickly begins to annoy everyone in town, including Lisa. Can they pull him back from the brink before he turns into a moonbat? Glenn Greenwald and Erick Erickson guest star. Homer starts a wacky new job as a gynecologist. Sarah Silverman guest stars. Through a series of comical mishaps, Ralph Wiggum, Homer Simpson, and Waylon Smithers accidentally join a white supremacist militia group and are forced to take arms against Springfield's minority population. Due to the poor economy, Homer is unable to find a wacky new job. When Moe marries Vice Principal Pettygrove (guest star Halle Berry), he finds himself in an all-out war with his resentful new stepdaughter Janey. And things go from bad to worse when he asks Homer for parenting advice! Can Moe and Janey reconcile their differences and learn to love each other before the big father-daughter dance? 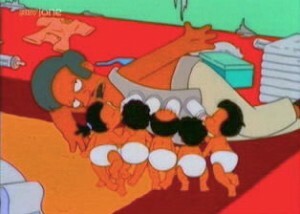 Apu sells his children on the black market. Bart, Lisa, Milhouse, and Janey start playing a mysterious video game that will have earth-shattering consequences. Meanwhile, Sideshow Bob attempts to make a jailbreak. Nicholas Cage guest stars. After Marge buys her first computer for the fourth time, she starts blogging about Maggie and becomes a famous "mommyblogger" overnight! But when she starts abusing her position to get free products, the FTC launches a raid on the Simpson household. Meanwhile, Bart and Milhouse paint the town red with fradulent Groupon coupons. Tiger Mother author Amy Chua guest stars. Sideshow Bob undergoes a heart transplant and receives a heart from a surprising organ donor - Maude Flanders! Meanwhile, Marge shops for a new purse. Ivanka Trump guest stars. Fed up with the hassles of modern life, Homer and the gang travel back in time to the Stone Age and discover "the simple life" isn't quite as simple as they thought it would be! Can they get back to present-day Springfield before their milk expires? Zach Galifianakis guest stars. A weird old gypsy casts a spell on Homer and Bart, making them switch bodies! After the obligatory hi-jinx ensue, Homer and Bart both learn valuable lessons about themselves and gain new respect for each other. Can Lisa help them change back before the clock strikes midnight? Bebe Neuwirth guest stars. When Bart wins ownership of Springfield's dilapidated monorail system, he can't resist playing a few pranks on his passengers, like turning off their cell phone service or shooting them in the back. Homer's job is in jeopardy when Mr. Burns dies and his brother Hans Moleman inherits the plant. Ralph Wiggum is murdered and Lisa is the lead suspect. Selma keeps falling down all the stairs. Apu wakes up dead in a ditch. Marge follows a Hot Wheel into a secret terrorist hideout. Viewers will decide the fate of Tina Ballerina and Corporal Punishment's affair. Maggie is left behind on a space shuttle. Moe's Tavern explodes. Bart's attempt to skateboard over Springfield Gorge again leaves him hanging from a cliff.